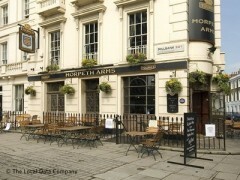 About: The Morpeth Arms is very popular with people visiting the neighbouring Tate Gallery. It is a Young's pub and was restored by them when they acquired it in 1984. There is therefore a good selection of beer, and the restaurant serves food between 11am and 6pm. Catering for private parties of up to 50 guests is available upon request and seating on the terrace area is provided, weather permitting. Now a fine Young’s pub in the heart of Millbank, The Morpeth Arms was once a holding point for prisoners being shipped to the colonies in the 19th century. Ever since then the ghost of one of the unlucky few that died in the cellars beneath the pub has refused to leave. Claiming reparations and getting nowhere he has decided to dedicate an eternity of haunting to the Morpeth Arms. This place is worth going to just for the food. Recommended!!! !